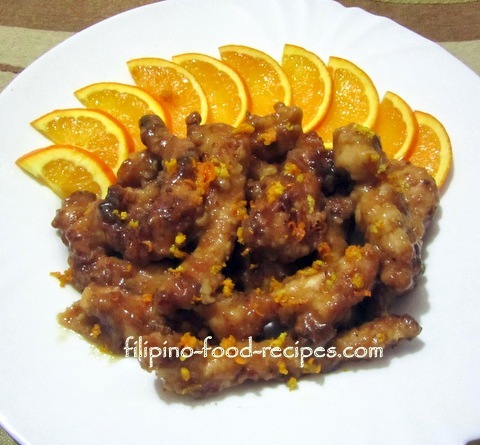 Orange Chicken is a popular Chinese dish, and became a Filipino favorite when the fast food chain Chowking started serving it in their menu. It is sweet and a little tangy, and always served with rice. Quite simple to make, yet very flavorful -- I just dredged the chicken in flour, fried them up and topped with orange flavored sauce. Some Chinese recipes would not season the batter, they would rely on the sauce to pump up the flavor. However, this one is done differently, as I like the orange flavor to be in the chicken as well as the sauce. Although this may look like a lot of ingredients but mostly are mere pantry staples. Sometimes, I would sometimes use pork, beef or even fish fillets, but my kids love the chicken, because it reminded them of Chowking's. 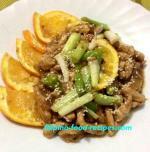 My kids love this chicken dish, and asked me to cook it quite often. Try making it for dinner tonight! 1 Marinate the chicken in orange juice, salt and pepper for one hour. 2 Mix the all-purpose flour and Magic Sarap, and dredge the chicken pieces in the flour mixture. 3 Shake off excess flour, then fry in batches. Put the chicken pieces on a platter and set aside. 4 Make the sauce by sauteing garlic, onion and ginger. Then add the soy sauce, Knorr, water and half cup orange juice and orange zest. 5 Thicken the sauce by adding the dissolved flour in water(slurry). 6 Pour the sauce on top of the chicken bites, sprinkle some orange zest and garnish with orange slices.